For a recent assignment aimed at enhancing mathematics thinking, I worked with colleagues to develop a body ratios activity at the grade 6 level. This activity falls under the proportional relationships unit (Number sense and Numeration strand) and addresses Overall Expectation 3, to “demonstrate an understanding of relationships involving percent, ratio, and unit rate.” (Ontario Ministry of Education, 2007). In her book About Teaching Mathematics: A K-8 Resource, 3rd Edition, Marilyn Burns (2007, p.72) lays out an excellent activity that requires students to use nonstandard measurements (i.e. string) to explore their own body ratios. Since our activity had to fit the “Barbies vs. Superheroes” theme of the class, we adapted this activity to incorporate the theme. Emphasize the use of appropriate notation: monitor the groups as they are working and watch for students who are recording ratios in reverse. Help them to record the ratios properly. Give time/space for unique body ratio explorations: while it can be beneficial to provide some examples/guidance of body ratios the students can explore, it’s also important to leave room for them to draw on their creativity and investigate ratios that are of interest to them. 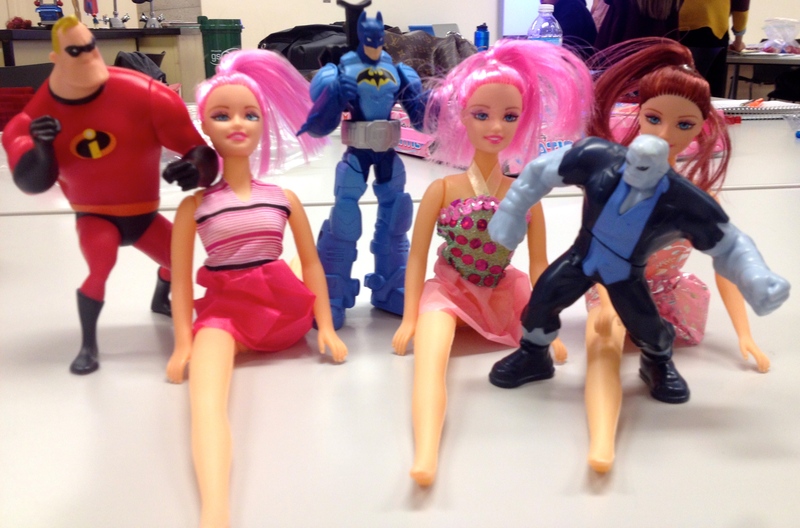 Consolidate the lesson with a discussion of “real-life” implications: the students were often surprised by the differences between their own body ratios and those of Barbie or their Superhero. Allow time for a discussion surrounding the cause of these differences, and what their implications might be (i.e. if Barbie were a real person, would she be able to stand? What would Mr.Incredible look like if he were human-sized? Are these figurines realistic when comparing to our own body ratios?). This exercise could also be partnered with a media literacy activity on the topic of body image and how it’s portrayed in the media. The options are endless! Burns, M. (2007). About Teaching Mathematics: A K-8 Resource, 3rd Edition. Sausalito, CA: Math Solutions.